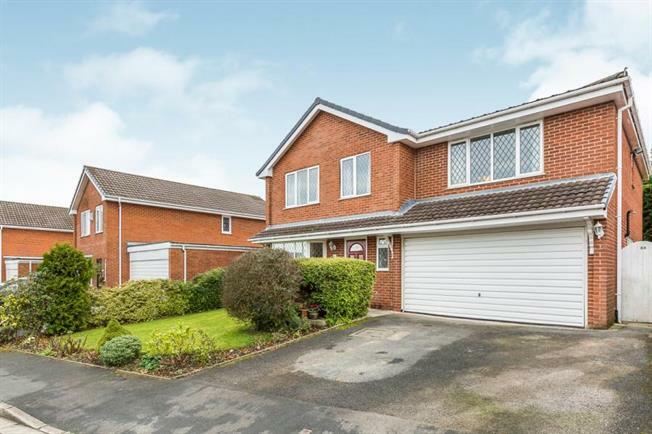 6 Bedroom Detached House For Sale in Chorley for Asking Price £350,000. Six bedroom extended family home is well worth taking time out to view, situated in a quiet Cul-de-Sac in the ever popular Pear Tree Avenue area within a short distance of the local Yarrow Valley Park, starting with the ground floor accommodation this fantastic home has a welcoming hallway with Wc/Cloaks fitted with a modern two piece suite, superb size open lounge dining room with French doors leading onto the rear garden, kitchen dining room with separate utility room and from this room access to the double integral garage, first floor there are five double bedrooms with ensuite and walk in wardrobe to the master, great size study and separate family bathroom. Externally there are well maintained gardens to the front and the rear with driveway for ample off road parking and direct access to the double garage. Early viewing is strongly advised on this highly desirable, well maintained spacious family home. welcoming entrance hall with cosy seating and stairs leading to the first floor. Fitted with a modern two piece suite with low level Wc, wash basin, tiled flooring and Upvc double glazed window. Fantastic size room with Upvc double glazed bay fronted window, living flame gas fire and Upvc French doors opening onto the rear garden. Fitted with a range of wall and base units with integrated double oven and hob, one and a quarter bowl sink and drainer with mixer tap, tiled flooring and to compliment, built in pantry cupboard and two Upvc double glazed windows over looking the rear garden. Sink and drainer, plumbing for appliances, Upvc double glazed door and window to the rear garden and access to the double garage. Loft access with pull down ladder. Master bedroom with fitted wardrobes, Upvc double glazed window, access to ensuite and walk in wardrobe ( which has loft access). Large ensuite bathroom fitted with a three piece suite with panel bath, low level Wc, pedestal wash hand basin and Upvc double glazed window. Double bedroom with Upvc double glazed window. Double bedroom with fitted wardrobe and over head storage and Upvc double glazed window. Fitted wardrobe and over head storage and Upvc double glazed window. Great size room which could be used as a sixth bedroom with Upvc double glazed window. Fitted with a three piece suite with panel bath with over head shower, low level Wc, wash basin, Upvc double glazed window and built in storage. Driveway to the front with access to the double garage, well maintained front and rear gardens with paved patio to the rear and gate access to both sides.